How much do parents spend on center-based daycare and preschool for their young children? In other words, what is the market price of these services? The answer is important for parents, government, policymakers, and providers. For the country as a whole, the median price for a family with the characteristics described above is $8,320 a year and $5.31 an hour. Families spend somewhat more in the Northeast and West, and somewhat less in the South and Midwest. Spending in absolute terms goes up with family income and education (e.g., a mean of $11,652 for families making more than $150k a year contrasted with $5,900 for families making from $50-60k a year). Conversely, spending as a percentage of family income goes down with rising socioeconomic status (e.g., 7% for families making $100-$150k vs. 12% for those making from $50-60k). Spending is inverse to the age of the child (e.g., $10,400 for infants vs. $6,500 for four-year-olds). One of the most provocative findings is that infants who are receiving center-based care for at least 8 hours a week, as is the case for older age groups in the sample, are in center-based care for many more hours a week than older children. For example, median weekly hours for such infants is 40, whereas it is 24 for four-year-olds. Questions about cost (how much is being spent) and price (how much is being charged) for the center-based care1 of young children loom large among parents, the childcare industry, policymakers, and government. This is notably so in efforts by city, state and federal government to expand access to center-based care, which involves fraught decisions about how much should be spent on each enrollee to make possible a quality program. This, in turn, interacts with political and budgetary realities to determine the ages and numbers of children that government decides to serve. For government and other funders, what is the right amount to spend on what type of center-based service for whom? How much of that expenditure should be borne by the parents of the young children receiving services (through, for example, a sliding fee schedule based on family income)? And, for parents seeking to purchase center-based care on their own dime or for government trying to generate reasonable estimates of the costs of expansion of public programs, what are the going rates? We are a long way from being able to answer questions about appropriate levels of expenditure for quality programs. This is due to the absence of credible research demonstrating causal links between child and family outcomes and levels of spending on center-based care. We can, however, fill in gaps in knowledge about how much is being spent. That is the question addressed here: How much are individual households spending to send a child to a center-based program when no one is helping them pay, i.e., what is the market price? Of course, price in this case is set in conditions that are far from a free and unfettered market. Government intervenes in numerous ways, including roughly $26 billion in annual spending by the federal government on programs and tax expenditures to support the care and education of young children.4 Some states and cities also have assumed substantial costs to provide free public preschool programs. Knowledge of the market price for center-based early childhood programs, notwithstanding that it is influenced by government expenditures, can be valuable to parents who are planning to have children and those already paying for services. Market price also provides a useful anchor for discussions and decisions about how much government should be spending. Similarly, information on market price can inform decisions by states or localities on how to set sliding fee schedules or eligibility cutoffs so as to focus state expenditures on families in greatest financial need, while not at the same time driving away families with higher incomes whose children can provide needed socioeconomic diversity in daycare and preschool centers. The information from providers is valuable but has limitations. Among them are that it is not collected in the same way from state to state; misses center-based programs that fall outside the licensed provider network; does not incorporate corrections for sample bias; and, most critically, does not incorporate information from individual families on their daycare and preschool expenses. Knowing what licensed centers across a state charge is not the same thing as knowing what parents pay. The price parents pay depends on the number of hours their child is enrolled, the child’s age, the parents’ financial resources, the communities being served, and many other factors. The price paid by parents for center-based care is to the Child Care Aware data as the amount of money that families spend eating out is to a compilation of menu prices of restaurants. To provide an estimate of parents’ expenditures on center-based case I take advantage of newly released data from the Early Childhood Program Participation Survey (ECPP), which was carried out on behalf of the National Center for Education Statistics by the Census Bureau as part of the 2016 National Household Education Survey.7 The ECPP was previously administered in 2005. The ECPP surveys a nationally representative sample of about 5,500 households with children under five years of age.8 Parents answer questions on their children’s participation in early childhood programs, including the hours that children spend in such programs and how much the parents are paying. The ECPP is administered to parents along with other survey questions that generate extensive background information on children and their families, e.g., the family’s total income and the parents’ education. I use a narrower selection window than NCES for age, as well as other variables described subsequently, in order to generate results on market price that are most applicable to the general customer base and policymaking context of center-based programs for young children. On children’s age, for example, a child’s entry into kindergarten in a public school typically requires that the child have turned five by September of the year of enrollment. The ECPP dataset provides a year-of-age marker for each child based on the child’s age on December 31, 2015. A child who is five at that point and is not enrolled in kindergarten is statistically unusual as well as likely to have characteristics or to be in circumstances that are different from those of the mass of children whose families participate in the market for center-based programs. Including these children in analyses and categorical summaries of usage and price, as NCES does, can be misleading or beside the point. For example, I cannot think of an interesting policy question that would be informed by knowing the percentage of children from three to five years of age who are in center-based care. In contrast, I have trouble thinking of any system-level policy question that would not be informed by knowing the percentage of four-year-olds receiving such services. NCES reports the former, but not the latter. On the same theme of aligning the analysis and reporting to relevant policy questions, I use a “customer subsample” that further restricts the population being studied to households in which parents purchase, without financial help from others, at least eight hours a week of center-based care for a child under five who does not have a disability. The disability exclusion is in place to avoid generating price estimates that are skewed upward by children who have special and costly needs. The exclusion of families who are receiving help from outside their household in paying fees is in order to determine what families themselves are able and willing to pay. The exclusion of families who are using center-based care for less than eight hours a week is to assure that the results are not distorted by families who are purchasing specialized or incidental services that are unlike in kind or price the typical center-based care on which this report focuses. In other words, the focus of the analyses that follow is on parents who purchase a significant number of hours of prototypical center-based care out of their own resources for a child under five who does not have a disability. This customer subsample of parents is, not surprisingly, more educated and affluent than parents who are identically selected except that the costs of their child’s attendance are covered in whole or in part by entities outside the family. For example, families that send their child to a “free” federally funded Head Start program are much more disadvantaged economically than the families in the present customer subsample who are paying the full freight for a fee-for-service center. Again, the goal of the present analysis is to estimate the market price of center-based care. Thus, the selection conditions generate a sample of the customers for centers that charge a fee. The following tables present the hourly and yearly price paid for center-based care by families in the customer subsample (fee-paying, self-financed households with a normally developing child under five years of age attending a center-based program at least 8 hours a week). Because the standard deviation for payments is so large (skewed upward by affluent families) I present the median for payments, along with the mean. The means in the table are lower than those reported by Child Care Aware based on its survey of program providers, but in the same range, e.g., the Child Care Aware average of state averages for the yearly price of infant, toddler, and four-year-old center-based care is $9,697,14 contrasted with $8,933 from the present sample of parents. Where does the price parents are paying for center-based care for a young child fit in the context of K-12 education? Recent figures indicate that the national average spending per child in public education is about $12,500 a year.15 The school year is roughly 7 hours a day for 180 days. That is roughly $10 an hour. So, K-12 public education costs more than parents are paying for daycare and preschool, which is reasonable given that K-12 education is a more resource-intensive activity, teachers typically make more, and the K-12 dollar figure includes spending on services for students with disabilities. The point is that the estimates in the tables above are in a reasonable range given what one might expect from the Child Care Aware survey and the calculated costs of K-12 education. There is an association between the mean values for hourly price by age of child in the following table, but the differences are smaller on an hourly basis than I would have guessed. Further, the only sizable dip in price occurs for four-year-olds compared to younger children, whereas the recommended maximum group size goes up for each age group. Where the received wisdom on the relationship between age of child and price is borne out is on yearly price, as presented in the following table. We see that the price parents are paying for their infant to attend a center-based program is about 60% higher than parents are paying for their four-year-old. What accounts for the divergence between the hourly and yearly price by age of child? The next table indicates that the underlying factor is the number of hours each week that the child is in center-based care. It is surprising to me that infants who are receiving center-based care for at least 8 hours a week are, on average, spending more time in center-based care than older groups of children (who are, likewise, in center-based care for at least 8 hours a week). Further, a median of 40 hours per week for infants means that half of them are in center-based care for more than 40 hours a week. My surmise is that parents who are paying for 40 hours a week, or more, of center-based care for an infant are doing so because they need to work, and infant care from another family member is unavailable, as is affordable individual care from an unrelated adult. The much larger group of parents who are purchasing center-based care for four-year-olds, in contrast, includes many families who are voluntarily enrolling their child for less than a full-time preschool experience and have options for the care of their child for the rest of the week, including having a family member care for the child at home. As depicted in the next table, the hourly price that families are paying rises with the educational level of the parents. Graduate and professional families pay more than twice what parents with less than a high school education pay. To the extent that price affects quality and quality affects long-term outcomes for children, this is a concern. Price is also affected by region of the country. As the next table shows, the Northeast and West are more expensive than the South and Midwest. 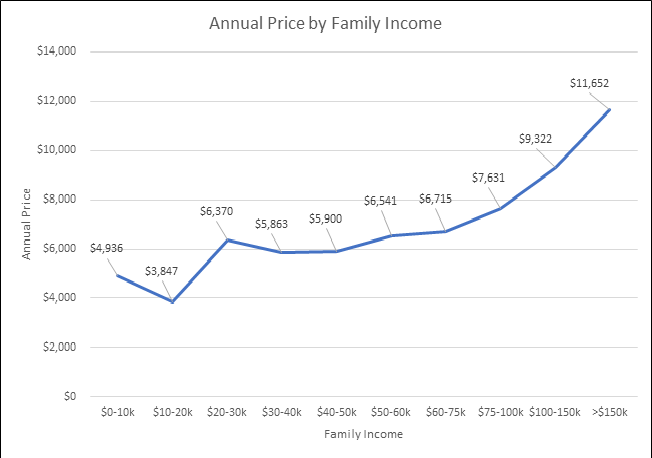 The strongest single variable in the data in terms of impact on price is family income, as illustrated in the next two graphs. Price rises substantially at the upper end of the distribution of family income. 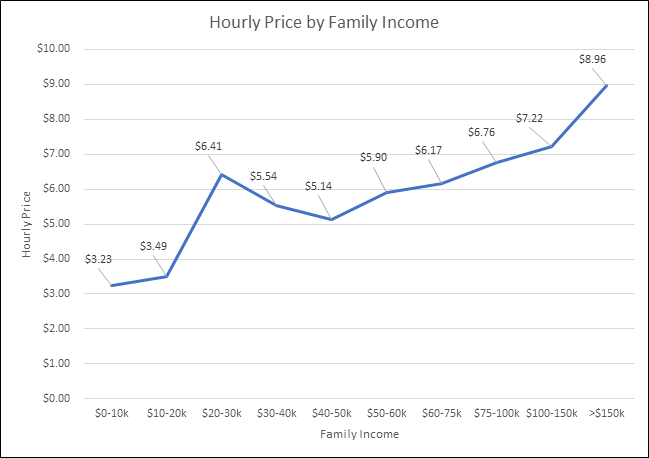 Price falls quite a bit at the lower end of the distribution.17 The overall similarity of the relationship between price and income in the hourly and yearly graphs suggest that it is not primarily differences in total hours of utilization that are driving the results. Rather, as is the case for the previously described relationship between parental education and price, families with more economic advantage are paying more. And, as before, to the extent that price is associated with quality and long-term outcomes, the disparity between affluent and poor families in the price being paid for center-based care is of concern. A central factor that seems to be driving differences in the price paid by families for center-based care is what economists would describe as the demand curve: the relationship between the price of a good or service and the amount of it that consumers are willing and able to purchase. In that regard, it is obvious that a family whose total annual income is between $10-20k will be very unlikely to pay over $11,000 a year for center-based care (the mean price paid by families making more than $150k a year). Differences in the demand curve by family socioeconomic status likely play out not only in what families pay but in the characteristics of the centers that serve communities in which most of the customers are within a restricted range of economic advantage. Thus, a center that serves an upper-class community will not only charge more to parents than a center that serves a lower-class community, but also spend more on staff and facilities and materials. An interesting and policy-relevant question about the demand curve is the proportion of family income that families are willing and able to spend on center-based care. The ECPP obtains reports of family income from parents only in the broad categories used in the two previous graphs, e.g., $60-75k. 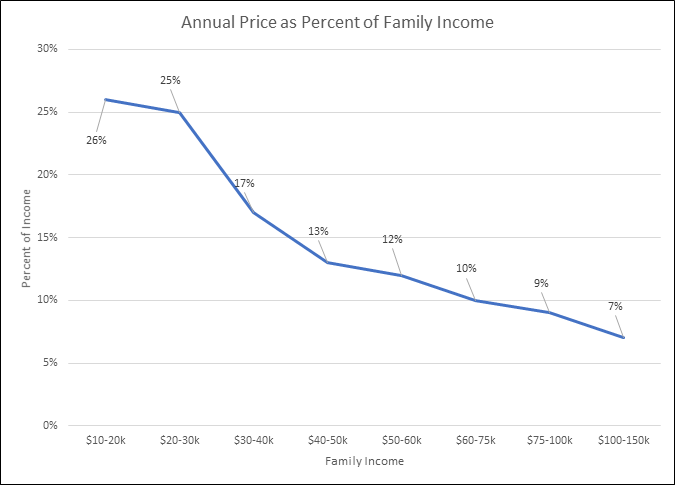 Using the midpoint of the separate ranges of family income depicted in the graphs, the following graph represents the proportion of family income spent on center-based care for one child conditional on level of family income. The graph excludes the highest category of >$150k (because it does not have a calculable midpoint), as well as the lowest category of $0-10k (because it has only a small number of sample units). The greater the income of families purchasing center-based care for a young child, the less the percentage of that income is spent on center-based care. At the same time, as made clear by previous graphs, more affluent families are spending more on center-based in absolute terms. In other words, the financial pain of purchasing daycare and preschool services is less for more affluent compared to less affluent families, whereas the absolute price of the service is higher for more affluent families, with likely impacts on quality. Evidence doesn’t speak for itself, but it gives voice and reason to those who see a problem and want to solve it. “Center-based care” is used herein to refer generically to any center-based program that is not in a private home and that provides regular care for young children in a group setting. This includes programs that primarily provide a supervised setting for children to play and engage in age-appropriate activities (daycare) as well as programs that have an explicit education mission (preschool or pre-K). The ECPP includes families with older children. Data in the present report are only for households with children under five years of age. The ECPP asks parents how much they pay for center-based care for their child, and then asks the temporal unit of that payment, e.g., hour, week, year. The parent is also asked the number of hours each week the child is in center-based care. Two of the units of payment the parent can report using, “per day” and “other”, cannot be decomposed into an hourly rate, e.g., a parent who reports her child is in a daycare center 10 hours a week and her daily rate is $20 could be paying $10 an hour if her child goes to the center five days a week or $2 an hour if the child only attends the center one day a week. Households using these two ambiguous reporting categories for units of payment (1.7% of the total sample) are excluded from analyses of the sample of self-financed, fee paying households. Also excluded, in order to be able to calculate spending per child, are households that report that their payment covers more than one child. All analyses reported herein use the full sample weights. This produces units for analysis that reflect the population the sample was drawn to represent. All the information generated by the ECPP is derived from the self-report of parents being interviewed. The respondents are subject to lapses in memory, biases, confusion about what is being asked, and lack of complete information. This, and the other associations highlighted in the text, are simple correlations, not demonstrations of causation. In this case, the relationship between price and family income might be partly driven by cost of living, i.e., in higher cost of living areas incomes and child care prices both tend to be higher. The ECPP does not provide data at a small enough geographical scale to explore this possibility.